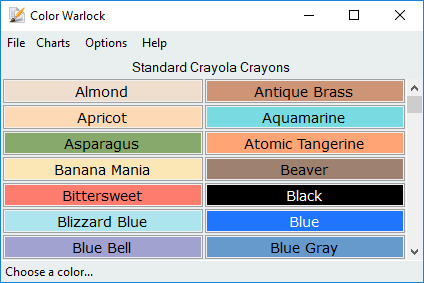 Color Warlock is a color chart program for building palettes and referencing color codes. 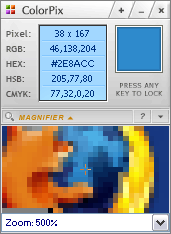 The program can copy html hex color codes and other color types to use and share them with others. View options include multiple columns, hex color values, and sorting by brightness, name and saturation. The program includes a Chart Builder to create your own color chart files or you can use available color palettes including a web safe selection, MS Office and even standard Crayola crayons. How to extract: Download the ZIP package and extract to a folder of your choice. Launch ColorWarlock.exe. 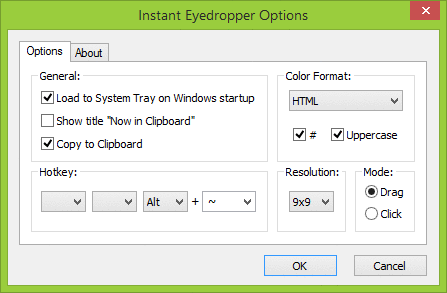 Instant Eyedropper is a simple color picker that sits in the system tray. Just click program icon and drag your pointer to the color you want to grab. Supported color formats include HTML, HEX, Delphi Hex, Visual Basic Hex, RGB, and HSB.